Having top-notch numerical and financial knowledge is only the tip of the iceberg when it comes to excelling as a financial professional. In other words, if you can’t perform the other basic functions of your job, the technical aspects of your job will also suffer. In order to stick around and get ahead in finance, you need to master several non-financial skills. Financial professionals can’t just be good at crunching numbers – they must be able to communicate their knowledge with strong speaking, writing and presentation skills. When you are presenting to a board, an investor or a prospect, you need to know how to convey complex information in a way people can easily understand. The people skills you need in order to succeed as a financial professional include, understanding different personality types, listening, asking the right questions, resolving conflicts, educating others and counselling clients. Financial professionals need to be able to market their professional skills and knowledge to prospects in their niche markets. To do so, it’s imperative to have a complete understanding of both your personal strengths and your firm’s professional strengths. You will always encounter problems in any job, and being able to solve them rather than cracking under pressure is essential. 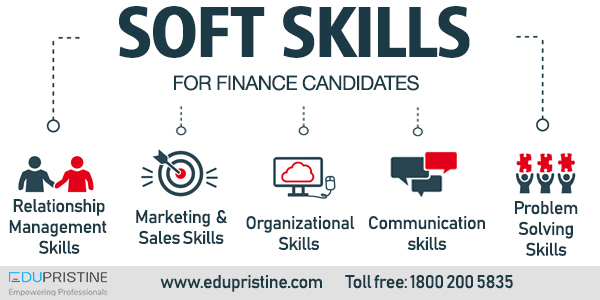 As aspects of finance and accounting roles become swallowed by technology, building communication skills and having soft skills training will be just one more string that Eduprisitine offers to its students.